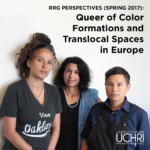 Queer People of Color (QPoC) positionalities are a valuable yet underexplored lens through which to rethink the racial and colonial imaginaries and material conditions of subjects and space in Europe. It brings together race, gender, class, colonialism and sexuality, inseparably, in a shared analytic. It addresses multiple erasures: of sexualities and race from discussions of space; of QPoC in Europe from discussions of European subjects, race and space; and from US-centric QPoC studies. Indeed Europeans are generally presumed to be homogeneously white, while people of color are generally presumed to be uniformly straight. Rarely is space understood as a formation that is co-constituted through sexualities with other relations of power. Our intervention radically rethinks urban environments in their relation to race, subjects and agencies. It also puts Queer People of Color (QPoC) in Europe on the map. We explore QPoC activism in Europe as an emerging formation that interrogates multiple conditions and relations of power as they produce exclusion, erasure and repression. What modes of making places and worlds, what transformative horizons come into view, if we take QPoC in Europe and elsewhere seriously as geographic subjects? How can city-space be reconceptualized from the vantage point of QPoC? What possibilities emerge if we examine strategies of resistance and coalitional politics as “translocal” rather than wedded to the nation-state? Given the centrality of gender and sexual violence in racist and colonial projects, what are the promises of centering gender and sexually non-conforming subjects in the study of racism and colonialism, and what would need to happen in order to home them back into antiracist and anticolonial projects? How does QPoC activism in Europe relate to spaces outside of Europe, beyond the US – in particular the Global South? How does this activism challenge the (re)production of Europe’s outside through ideological and material violence against people of color within or outside its borders? We propose QPoC not as the only, but as one in a range of possible modalities that may well open up new ways of looking translocally at space and race, and of resisting racist and colonial control.